It follows pro-boycott motions being passed by a number of trade unions and student unions. The mood for boycott reflects strong feelings of indignation and outrage against Israel, and a powerful sentiment that something –anything – must be done to help the Palestinians. However the main forces behind the “boycott Israel” movement, and several of the signatories of the Guardian ad, want to go further than a just (probably “two state”) resolution to the plight of the Palestinians and an end to the illegal Israeli settlements and occupation of Palestinian lands: they are committed to the destruction of Israel and its replacement by an Arab state in which those Jews who survive the military conflict and its immediate aftermath would have religious but not national rights. (Or, if the destruction is accomplished by Islamist movements like Hamas and Hezbollah and their allies, and “victory” means an Islamic state, maybe not even religious rights). The equation between Israel and apartheid South Africa is frequently made by supporters of the boycott movement — on two levels. The precedent of the South African boycott is invoked to give an emotional appeal and “respectable” gloss to the campaign. And Israel is said to be identical to, or travelling fast to being identical to, apartheid South Africa. An international boycott lasted from the beginning of 1960 to the end of apartheid in 1994 — that is, for 34 years of the 46 year life of full-blown apartheid. A campaign that lasted so long, without any change in what it was campaigning against until the very end, was self-evidently limited in its effect! In fact change came in South Africa not from the boycott, but from the struggles of the new black-majority unions which grew up in South Africa in the 1970s and 80s and of the populations of the townships. The boycott was a very limited tactic, and not without problems. The boycott “principle” was used by the ANC to oppose direct links between British unions and the emerging black majority unions in South Africa. A boycott of Israel will have very little, if any, effect in putting pressure on the Israeli government to concede relief to the Palestinians. And it will have big downsides. It will boost the Israeli right by strengthening the “siege mentality” among Israeli Jews which that right wing feeds on. The Israeli unions, though their policies on Palestinian rights are not all that we we would wish, are genuine workers’ unions, that (contrary to what some people in the anti-Israel movement claim) include Palestinian and Arab members, and are not comparable to the whites-only unions in South Africa. There are many pro-peace organisations in Israel with which we can and should work. Boycotting all Israeli institutions cuts off the channels for working with such forces. 1. History tells us that the response in Israel to such actions is a heightening of the siege mentality, and a consolidation of the majority of Israeli society around the chauvinist right wing, rather than an opening-up. 2. Although some supporters of the boycott back a “two-states” solution such as advocated by the main secular Palestinian movements, the groups most active in the boycott/BDS campaign (and several of the Guardian ad’s signatories) do not. They do not want Israeli politics opened up so that advocates of “two states” can win a majority there. They want Israel conquered and subsumed in a broader Arab-ruled state. 3. The boycott/BDS movement defines the aim as “to target apartheid Israel, just as apartheid South Africa was targeted”. The boycott of apartheid South Africa was universally understood as a move to isolate and stigmatise the ruling elite in South Africa and its particular laws, to be coupled with extending links to the majority of the population in South Africa. The “apartheid Israel” trope is an attempt to isolate and stigmatise the whole of Israel, and to equate it with the ruling white minority in apartheid South Africa, as an enemy to be subdued and overthrown. 4. Although the boycotters claim to be targetting the Israeli state and/or government, and the Guardian ad states “We will, however, continue to work with our Israeli colleagues in their individual capacities”, inevitably such a campaign will single out “Zionists” – ie the vast majority of Jews worldwide. An extension of the boycott movement could not but become a movement against everything Israeli and everything pertaining to that huge majority of Jewish communities worldwide who instinctively identify (though maybe critically) with Israel. Whatever the original intentions of the boycotters, it could not but become an anti-semitic movement. To argue that socialists should not term Israel an “apartheid state” is not to deny the tremendous oppression and injustices that Israel heaps on the Palestinians. To argue against boycotting Isaeli-linked academics and/or businesses and/or artists is not to defend the actions of the Israeli Defence Force. Like the boycotters we are for the liberation of the Palestinians. The disagreement is not that the oppression of the Palestinian people is not bad or not real — it is over the best way to end it. And the method that the boycotters offer may make them feel a bit better about themselves, but is fundamentally misguided, and can offer no hope to the Palestinians. Israeli society is not like South African society. In Israel, Israeli bosses exploit Israeli workers. Israelis are not an exploiting caste. They are a nation, divided along class lines. The Israeli working class — including Israeli Arabs and other oppressed minorities within Israel — are right now waging big struggles against their exploiters. This working class is held back by nationalist ideas, to be sure — but it is possible and necessary to fight against those ideas, and build a working-class movement which fights not only for its own rights, but also against the oppression of the Palestinians and against the occupation — and which unites with the Palestinian workers and oppressed. This fight is indispensable for social progress in the region. Without some element of a united movement of Israeli and Palestinian workers, just about the only agency which could force Israel out of the occupied territories would be a successful military invasion of Israel by her neighbours, an invasion which could only end in even worse horror. And because such an invasion is unlikely, the corollary of implicitly relying on it is to allow the occupation of Palestine to fester. It will continue to breed both Arab and Israeli chauvinism, and that will boost the strength of the Arab and Israeli ruling classes. To declare Israeli an apartheid state is to say that the Israeli working class is either so privileged as not to count, or is irredeemably racist. It means accepting defeat from the outset, saying that no positive change can come from within Israeli society. It disorientates anti-occupation activists. A boycott cuts against workers’ unity. It feeds the siege mentality that the Israeli ruling class uses to limit workers’ struggles and shore up their authority. The boycott tactic aims only to bludgeon Israelis indiscriminately — for in the unlikely event of the boycott having any palpable economic effect, bosses will surely pass the cost onto workers. Discussion of how best to help the Palestinians is diverted into enumerating the crimes of the occupation — but the issue at hand is how to defeat the occupation! The position of at least some in the boycott/BDS campaign seems to be that anyone who disagrees with the boycott tactic must be a secret supporter of the Israeli government and not “really against” the occupation. The best that the boycotters can say for their tactic is that it chooses its targets carefully, “based on their direct contribution to grave human rights abuses and international law violations of the Israeli state and military, or to rebranding campaigns that attempt to whitewash Israel’s crimes” (to quote the BDS campaign) and not on the nationality/ethnicity of the individual targets. But this definition is impossibly broad! Given the penetration of the occupation throughout the Israeli economy and the fact that the IDF is a conscript army, which companies or academic institutions based in Israel – or, indeed, individual academics – could not be accused of making a “direct contribution” to the occupation? 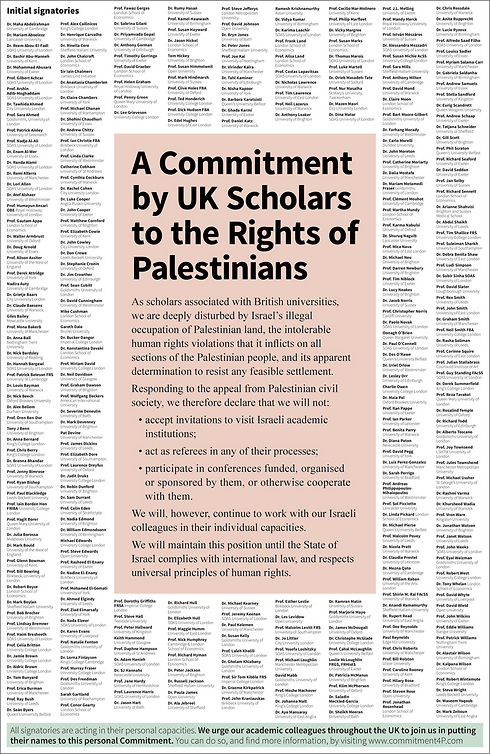 The indiscriminate nature of the boycott tactic is in fact best demonstrated by the academic boycott of Israel advocated by the Guardian ad, which aims at driving Israeli academics out of global academia, despite the claim that “we will, however, continue to work with our Israeli colleagues in their individual capacities.” The terms the boycott as described in the Guardian ad are potentially so broad that they encompass any academic based in or linked to Israel and even those that are critical of the Israeli government or oppose the occupation. The logic of the boycott tends towards a general hostility towards Israel as such. This is no political programme on which to build Israeli and Palestinian workers’ unity — it is a counsel of despair. Socialists who want to see the liberation of Palestine should concentrate instead on making solidarity with workers’ struggles and social movements in Israel and Palestine, like the Israel/Palestine Workers’ Advice Centre or the Gush Shalom peace bloc — developing the forces that can really fight the occupation and achieve justice for the Palestinans by means of a Palestinian state alongside Israel and equal rights for Palestinian/Arab citizens of Israel itself. Academics! Does that mean they are supposed to be clever people? And we should listen to them. Hate to say it, but the overthrow of apartheid in South Africa worked out just dandy for most of the population. NOT. (Not that that is an argument for maintaining the divisive system.). There’s a lot of nonsense talked about Israel/Palestine by all sorts of people who are “pro” this that or the other. (What type of creature supports one people over another people anyway?) Further I doubt BDS will do very much. It seems to be little more than an opportunity to feel like you are doing something, to show your moral superiority. There is something tasteless about it. However the serious argument against BDS is that it supports the right of return of refugees and thus supporsts the destruction of the Israeli state and thus supports the genocide of the Israeli Jewish people. The syllogism is bogus of course relying as it does on hysteria. But more seriously I simply wouldn’t want to have anything to do with people who could look a refugee from some camp Lebanon (say) in the eye and tell them they do not have a right to return to their homeland. To be morally righteous about such cruelty just adds fanatism to the callousness. I support BDS, because it applies light pressure. It’s better than no BDS. But secretly I support it because the campaign against it is vile. “But secretly I support it because the campaign against it is vile”: so those of us who support two states are “vile”, Eric? You don’t want to talk about refugees so you change the subject. Standard politician’s answer. You should get a job as a spad. I’m only too happy to discuss refugees, in Lebanon, or anywhere else. What’s that got to do with an (inevitably) anti-Semitic boycott campaign? Boycotts are blunt tools of dubious efficacy but I think you would have to be a lunatic to think that boycotts are inevitably racist. I wish the left would focus more on class than on race. It is not a secret anymore you have just bubbled on yourself. So you think if every Palestinian refugee moved to what is now Israel, they would massacre every Jew in sight? That’s a rather racist thing to think. It is what the Nazis did and they did not move to Israel. And do remember Adolf had an Arab Palestinian fan base. He also had a Japanese one, but I believe jews living in Japan are safe. Palestine is no more the homeland for the Palestinians, than Britian is for the British. You don’t believe me? Remember what Marx said about the workers having no country, you can’t take away from them what they never had. As for an academic boycott, if 4 wars didn’t work I can’t see how this will. Though for utter lunacy you should see what the Palestinian Solidarity campaign believe in, “Palestine for the Palestinians” is their slogan…sound familar? Yes, the BNP have a similar slogan for Britain. Though the PSC want to ban Drs and nurses, who qualified in Israel for working in the NHS. I never gave that Marx quote any credence. If you are born and live in a country then it is your country. Wealth power and possessions is irrelevant. Yet a land survey from 1936, showed that 99.8% of the land in Palestine was owned by less than 1% of the pop. So did it really ever belong to the Palestinians? Then that’s a PSC problem. No American group that I know of uses that slogan. Every BDS activist I’m close to wants two democratic states or a democratic binational state. They can wish for what they want, but they won’t get it. You’d have more luck asking Britian and Bulgaria to go half-and-half on their territory. Great deal for the Bulgarians but not for the British. But even if you got two democratic states so what? Palestine would be a deeply conservative & capitalist state. Just what the World needs! Steven land ownership in a country is not the issue. I have a small garden but some do not however it makes no difference as we live in the same country. Norman Finkelstein has been right most of the time so he’s allowed to be wrong at least once. Anyway. It’s two late for two states. For reasons of geography — because of the “islands of settlement” which permeate the Palestinian areas, and because the present Israeli state simply won’t tolerate a return to 1967 borders. Also because, although the labor force in Israel is mixed — part Israeli-Jewish, part Palestinian — there is little Palestinian capital (something few ever much talk about). So I think it’s time to go back to the position that Hal Draper and the Independent Socialist Committee had — for a democratic bi-national state a la Belgium. Let there be a militant Palestinian civil rights movement throughout all of “Greater Israel” with this demand and socialists should support it. Binationalism is a complete fantasy: people think two states is difficult and unlikely – the its difficulties pale into insignificance compared with binationalism. The Judah Magnes bit is too old to be of relevance. I gave reasons already why it’s too late for two states. You might want to think about them. Does anyone really think that any Israeli government will ever face down the settlers and their powerful lobbies and allies and move many thousands of very large, often armed families of religious fanatics back across the Green Line? We know that the settlers often are unafraid to use arms against the IDF to hold onto “their” land. Judging from the resistance to evacuating the relatively few settlers from the tiny Gaza Strip, it is extremely likely that massive, violent resistance by the Israeli religious Right would occur in both the West Bank and inside Israel “proper.” No Israeli government is likely to take such a risk. We must recognize – regardless of the juridical situation – that the Palestinian people live under the aegis of the Israeli state. See also recent writings by Gideon Levy. The basic demand for addressing the position for the Palestinians today is not a separate state, or even the establishment of a single “secular democratic” state incorporating Israel (a la the old PLO demand), but the creation of a Civil Rights Movement that can unite both Jewish and Palestinian workers for a struggle for basic democratic and civil rights for all Palestinians in Israel “proper” AND “Greater Israel,” including the right to elect representatives to the Knesset. If such a movement is successful, the result may very well be a bi-national state. Such an idea goes against the grain of recent history but it is certainly more plausible than the idea that Israel can be both “democratic” and “Jewish,” particularly given the so-called “demographic threat” that Arab birth rates present within Israel. A bi-national Israel/Palestine would also effectively address the question of the “right of return” of Palestinian refugees in a way that the two-state solution cannot. (There could also be a “law of return” for Jews fleeing from genuine religious/ethnic persecution.) As the result of a joint effort between (leftist) Jews and Palestinians, it would ensure national self-determination for the real “Jewish nation” – the Hebrew-speaking nation born in Israel. When it comes down to it, the argument against boycott is always an argument for division and an acceptance of the logic of zero sum games. A very moving letter. Logically, the author should want a two states solution, as far as I can make out. It’s certainly not making any kind of case for a boycott. The BDS platform is consistent with two states. People object to BDS because they object to refugee rights. “just conditions”…wtf are they! I certainly would not say you’ll find them in an Islamic state, which is what Palestine, under a two state solution would be. When it comes down to it, as socialists we are on the side of the working class and only the working class. Agitating for the immediate abolition of all states sounds a bit maximalist to me. Eric, are you a mind-reader? As for me I object to the two state solution, as it’s not a solution and because I’m a socialist. Two capitalist states, with one of them being reactionary…no thanks! Both capitalist states would be reactionary. Agreed. So not much of “solution” to be found there. Unless you like capitalist & reactionary states. The immediate abolition of nation states has always been a fundemental part of socialism/communism. Those that don’t argue for the immediate abolition of them cannot call themselves socialists/communists. You’re confusing communism (Marxism) with anarchism. Marxists fight for workers’ states which will wither away over time.